English rabbi and communal worker; born at Aussee, Moravia, Dec., 1816. He studied first at Olmütz, and then moved to Vienna, where under Professor Steinschneider he began a systematic study of Hebrew and Arabic. A few years after the formation of the Reform Synagogue in London, Löwy was appointed minister in association with the Rev. Professor Marks, whom he assisted in compiling the prayer-book of the congregation. He served for fifty years, retiring in 1892. From 1871 to 1889 he acted as secretary of the Anglo-Jewish Association, which, with Dr. Benisch, he had helped to found. Löwy's knowledge of Samaritan literature enabled him to collect and catalogue the Samaritan manuscripts belonging to the Earl of Crawford and Balcarres. He printed in the "Trans. Soc. Bibl. Arch.," 1875, the first specimen of a dialect of Aramaic current among the Jews of Urmia; and his contribution gave rise to the subsequent literature on the subject. In 1891 he printed a "Catalogue of Hebraica and Judaica in the Library of the Corporation of the City of London," with a copious subject-index. In recognition of his researches, the University of St. Andrews conferred upon him in 1893 the honorary degree of LL.D. 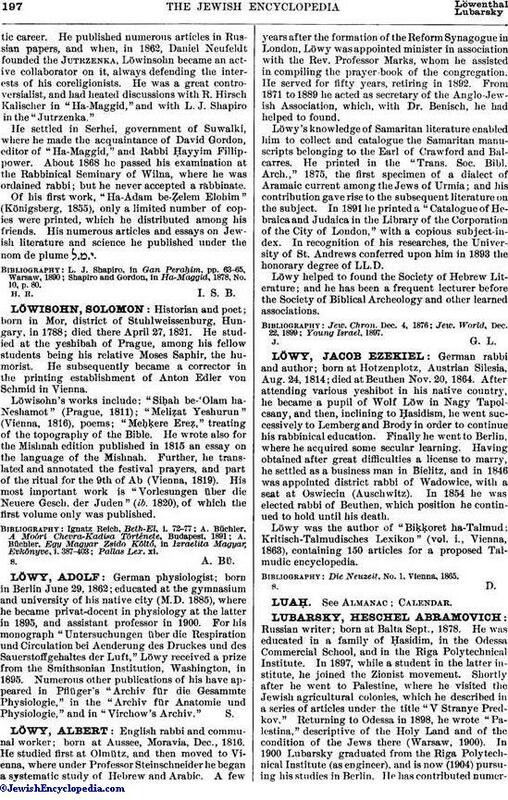 Löwy helped to found the Society of Hebrew Literature; and he has been a frequent lecturer before the Society of Biblical Archeology and other learned associations.